- None but only done different training program to run Intraocular Lens Plant at Nepal and it is worldwide renowned company and selling more than 80 Countries in the world. Honours : Recipient of Technical Cooperation Scheme of Colombo Plan scholarship for studying Bachelor of Engineering in Calcutta University, India. Recipient of Australian Government Scholarship for studying Master of Engineering in Asian Institute of Technology, Thailand. Life Member, Nepal Engineers' Association (LM 1878). Life Member, Society of Irrigation Engineers, Nepal. Life Member, International Network on Participatory Irrigation Management(INPIM), Nepal. Life Member, Nepal Cultural Association . Member, International Water Resources Association. Member, Rotary Club of Dillibazaar etc. I am basically a water and energy expert and have served in several capacities in The Ministries of Water Resources, Energy, Federal affairs and Local Development, Peace and Reconstruction and Office of the President for 33years, from 1980 to 2013. I started my career as an engineer in Gandak Project covering irrigation command area of more than one million hectare in Nepal and India; a joint project between Government of Nepal and Government of India in 1980. Major works were water management, flood control and irrigation system development. I also worked as an Engineer in Chief of Hill Irrigation Project, funded by ADB, in western region, Chief of Ground water project in the Terai region of Nepal, Regional Director of Irrigation Department for western Region and Director General of Department of Water Induced Disaster Prevention. I was then promoted to the post of Executive Secretary in Water and Energy Commission in 2007. I have worked as permanent secretary in Office of the Prime Minister and Council of Ministers, Ministry of Peace and Reconstruction, Ministry of Energy, Water and Energy Commission, Ministry of federal Affairs and Local Development and Office of the President mainly focusing in planning, policy formulation, implementation, monitoring and evaluation works etc. I coordinated WASH program as a secretary in the Ministry of Federal Affairs and Local Development. I was key person in formulation of Integrated Water Resources Management Project (IWRMP) and also its implementation. I was a key person for compiling and publication of National Water Plan, 2005 of Nepal as secretary Water and Energy Commission of Nepal. I have represented the country in more than two dozen minister/ secretary/ joint secretary/ executive engineer/ engineer level joint meetings between Nepal and India, Nepal and Bangladesh, Nepal and China, Nepal and the USA and at SAARC, BIMESTEC etc as team leader or member. I have joined short and long term assignment in different countries of the world in the field of water, energy, disaster mitigation, sabo works, governance, rural development, peace process formulation and implementation. He has also represented the country in the presidential and prime ministerial delegations. I have published many articles in national and International journals, newspapers, magazines and conducted many seminars and trainings. I have two books under publication. Asian Institute of Technology, Thailand, Master of Engineering (Water Resources 1989-90) in Agricultural Land and Water Development. Thesis: “Optimal irrigation water allocation under conjunctive operation of dam and aquifer”. Bengal Engineering College, Calcutta University, India, Bachelor of Engineering (Civil 1975-80). Project in design and construction of hill roads. Tribhuvan University, Kathmandu, Nepal, Bachelor Arts (1973-75). Specialized in Humanities and Mathematics . · Senior Executive Development Program (Training for senior level Government Officials), Nepal Administrative Staff College, 2000-2001. · FIDIC Procurement Training, World Bank, Dhulikhel, 1998. · Crop Diversification and Irrigation, JICA and National Irrigation Administration, Manila, the Philippines, Sep - Oct 1995. · Managing Performance Effectiveness of employees, Nepal Administrative Staff College, 1994. · Trainer's Training, Nepal Administrative Staff College, 1992. · Development Administration, Nepal Administrative Staff College, 1990. · Monitoring and Evaluation of Irrigation Systems, National Irrigation Administration, Manila, the Philippines, Sep - Oct 1985. · Computer Skill: MS office and Programming languages. Jalsrot Vikas Sanstha. (May, 2013 to present). Expert water and energy. Studying existing water sharing status and riparian issues in south Asia as water and energy policy expert in the following areas (i).working out water resources potential of different countries of the region (ii) analysing existing water use scenario of the countries (iii) study existing water sharing agreements in the region (iv) extrapolate and analyze future water sharing scenario in the region (v) analysing possible future conflict in water sharing, (vi) studying effect of flood and drought in West Rapti river basin. Office of the President. (October, 2013 to May, 2013). Worked as Permanent Secretary, Government of Nepal. Main responsibilities: (i).managing and administrating office of the president (ii) reviewing recommendations of the government (iii) supervising overall activities in the premises (iv) reviewing overall progress of ‘President’s Chure Area Conservation Project’ (v) assisting appointment of chief and members of constitutional bodies etc. Ministry of Federal Affairs and Local Development, Government of Nepal. (October, 2011 to October, 2013). Worked as Permanent Secretary, Government of Nepal. Main responsibilities: (i).preparing annual plan, budget and program of the ministry (ii) preparing rules, norms, standards for district and village governments (iii)supervising overall performance of local development works (iv) Supervising rural roads, disaster mitigation works (v) keeping vital registration records (vi) coordinating different donor agencies (iv) conducting and participating in different national and international dialogues, seminars etc. Water and Energy Commission Secretariat, Government of Nepal. (June, 2011 to October,2011). Worked as Permanent Secretary, Government of Nepal. Main responsibilities: (i) preparing national vision for water and energy development (ii).preparing laws, regulations, norms, standards for water, disaster prevention and energy sector of Nepal (iii) preparing master plan for water and energy development and utilization (iv) forecasting energy demand for the country (v) compiling and publishing annual national energy consumption data (vi) conducting and participating in national and international workshops, seminars and dialogues (vii) representing Nepal in international negotiations. Ministry of Energy, Government of Nepal. (December, 2010 to June, 2011). Worked as permanent Secretary, Government of Nepal. Main responsibilities: (i)finalizing plan, budget, management and development of energy generation in Nepal (ii) setting priority of development in energy sector (ii) formulating policies, norms, standards and guidelines for speedy development of energy sector (iii) planning multipurpose hydropower, irrigation and flood mitigation projects (iv) helping different energy development partners for development of energy in the country (iv) representing Nepal in different forums. Ministry of Peace and Reconstruction, Government of Nepal. (April, 2010 to December, 2010) ). Worked as permanent Secretary, Government of Nepal. Main responsibilities: (i).helping for speedy completion of peace process (ii) management of cantonments with logistics and other necessary facilities (iii) helping for speedy integration of combatants in society. Ministry of Water Resources. (June, 2006 to February, 2010). Worked as Joint Secretary. Main responsibilities: (i) preparing annual and periodic budget and program (ii) compiling and evaluating progress of different activities under the ministry (iii) compiling and recommending needs in water resources development sector (iv) formulating rules, regulations, norms and standards (v) participating in different bilateral and multilateral forums (vi) coordinating flood control and rehabilitation works for Koshi river left bank breaching closure and disaster prevention works. Water and Energy Commission Secretariat. (November, 2005 to June, 2006). Worked as Executive Secretary. Main responsibilities were: (i).preparing laws, regulations, norms, standards for water and energy sector of Nepal (ii) preparing master plan for water and energy development and utilization (iii) preparing water resources development strategy (iv) preparing national water plan,2005. (v) forecasting energy demand for the country (vi) compiling and publishing annual national energy consumption data (vii) conducting and participating in national and international workshops, seminars and dialogues (viii) representing Nepal in international negotiations. Department of Water Induced Disaster Prevention. (August, 2003 to November, 2005). Worked as Director General. Main responsibilities were: (i) Planning and supervising water induced disaster prevention activities in the country (ii) preparing annual budget and program for the department (iii) preparing long and short list of projects and programs for the department (iv) managing human and financial resources of the department (v) preparation of policy, law, norms, standards, specifications etc for water induced disaster prevention. (vi) conducting national and international workshops and seminars (vii) leading bilateral and multilateral dialogues (vii) preparing master plan for water induced disaster prevention activities (viii) initiating flood monitoring and forecasting works (ix) establishing regional ware houses and shelters for water induced disaster victims in five regions of Nepal (x) Studying backwater effects in Nepal by embankments constructed on the other side of boarder. Western Regional Irrigation Directorate, Department of Irrigation. (November, 2000 to August, 2003). Worked as Regional Director. Main responsibilities were: : (i) supervising and directing all sixteen districts of western region of Nepal (ii) preparing annual budget and program (iii) monitoring and evaluation of different activities under western region (iv) approving irrigation and water induced disaster prevention projects and programs for the region (v) coordination with other regional agencies (vi) preparing investment proposals for irrigation projects in the region (vii) performing administrative and financial administration (viii) studying mass waste and debris flow in the region. Department of Irrigation. (September,1998 to November, 2000). Worked as Superintending Engineer. Main responsibilities were: (i) preparing annual budget and program for the whole country (ii) Monitoring and evaluation of different activities under Department of Irrigation. (iii) Preparing policy, guidelines, norms, standards, specifications etc related to irrigation development and disaster mitigation for government of Nepal (iv) coordination with other institutions related to agriculture, irrigation and disaster mitigation activities (v) conducting and participating in seminars, workshops, bilateral and multilateral negotiations (vi) checking and finalizing project proposals, contract documents etc. (vii) conducting feasibility study and preparing long and short lists of projects and programs. Far Western Regional Irrigation Directorate, Dhangadhi. (March, 1998 to September, 1998). Worked as Senior Divisional Engineer. Main responsibilities were: (i)working as acting regional director of far western region (ii) coordinating identification, planning & design and approval of project up to NRs 10 million of surface and groundwater irrigation subprojects in Far Western region under Irrigation Line of Credit (WB funded); (iii) initiating formation of water users’ association ; (iv) providing training to the WUA members, farmers and subproject staff; (v) preparing annual plan and budget ; (vi) monitoring and evaluation of activities of all districts and projects in the region (vii) planning, resource allocation, design and supervision of water induced disaster prevention works in the region. Central Regional Irrigation Directorate, Lalitpur. (December, 1995 to March, 1998). Main responsibilities: (i) participating in identification, planning & design of surface and groundwater irrigation subprojects in central region; (ii) coordinating formation of water users’ association ; (iii) providing training to the WUA members, farmers and subproject staff; (v) preparing annual plan and budget ; (vi) performing monitoring and evaluation of activities of all districts and projects in the region (vii) planning, resource allocation, design and supervision of water induced disaster prevention works in the region. Ground Water Irrigation Project. (March, 1992 to December, 1995). Main responsibilities: (i) Planning, designing, and management of groundwater irrigation in Nawalparasi, Rupandehi and Kapilvastu districts of Nepal; (ii) supervising construction management, quality control and supervision of tubewell irrigation systems in the project area; (iii) coordinating formation and strengthening of water users’ association; (iv) preparing periodic project progress report; (v) guiding and mobilizing consultants for different activities of the project . (vi) managing financial and human resources of the project (vii) performing administrative and financial administration. Irrigation Sector Support Project, Kathmandu. (September, 1990 to March, 1992). Main responsibilities: (i) planning, programming and designing irrigation subprojects; (ii) preparing annual budget model contract documents (iii) evaluating proposals for feasibility study of different subproject, (iv) evaluating contract proposals (v) preparing management information system for projects and personnel associated with the project (vi) preparing model contract documents. Asian Institute of Technology. (January, 1989 to September, 1990). Studied Master of Engineering (Water Resources) at Asian Institute of Technology, Thailand. Western Regional Irrigation Directorate, Pokhara. (March, 1986 to January, 1989). Worked as Engineer in Charge. Main responsibilities: (i) designing and supervising hill irrigation subprojects in Palpa, Syangja, Parbat and Kaski districts of western region of Nepal (ii) providing assistance in organization and strengthening of water users’ groups (iii) providing assistance in preparing work scheduling for rehabilitation/upgrading works (iv) performing regular progress monitoring of all subprojects (v) preparing project status reports (vi) providing training to members of the user groups and subproject field staff (vi) working closely with consultants and donors (vii) preparing maintenance plan of all irrigation projects in the region (viii) preparing annual budget for the region. Command Area Development Project, Nepal Gandak Western Canal Project, Nawalparasi. (September, 1980 to March, 1986). Worked as Engineer. Main responsibilities: (i) performing planning, design, quality control, supervision and construction management works of different canal and drainage systems, feeder roads, and office buildings (ii) supervising the construction of five 500 MT capacity warehouses in the command area (ii) preparing tender and contract documents; (iii) planning and preparing annual programs for the project (iv) carrying out contract management of several civil works contracts; (v) preparing annual budget, annual work program and regular progress report and (vi) organizing water users’ groups (WUG) at the tertiary level by involving farmers in system management. (vii) supervising water induced disaster prevention works of Gandak (peak flow 20000 cumec) and tributaries (viii) coordinating Indian counterparts (ix) negotiating in bilateral issues with India. Publications in International and local Journals, periodicals and newspapers, book entitled “ Fundamentals of Hill Irrigation” and "Nepal India and Water Resources” under publication. Er. 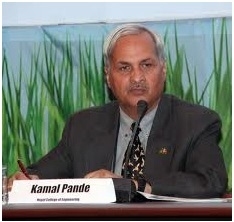 Kamal Raj Pande retired from the Government of Nepal as the Joint Secretary from the Ministry of Physical Planning and Works (MoPPW) in January 2012. He completed his Masters of Engineering in Geotechnical and Transportation from the Asian Institute of Technology, Thailand, four years after joining the Government of Nepal in 1979. He is currently working as an Infrastructure Specialist in projects under The World Bank, UNCRD and ADB as well as a part time professor teaching Transport Economics at the Nepal Engineering College. He has developed expertize in the field of public procurement, urban transport, institution and procurement policy. While at the MoPPW, some of the projects he was involved in were preparing the Three-year Interim Plan, monitoring and reporting donor funded projects, coordinating project restructuring of Kathmandu Valley Drinking Water (KUKL), coordinating study on “Sustainable Urban Transport”, preparing project and implementing Kathmandu Terai Fast Track, etc. With 34 years of government service, he has extensive knowledge about road maintenance and development including formulating policies, designing standards, norms, quality standards and MIS for roads and brides in Nepal. Before working at the MoPPW, Mr. Pande was in the National Planning Commission and the Department of Roads. Mr. Pande has received the Civil Service Award from the Government of Nepal in 2003 to acknowledge his dedicated service to the country. Some of his other achievements include the Outstanding Alumni Award by AIT Alumni Association in 2006, Gorkha Dakshin Bahu 4th Class Medal for his commitment at the SAARC Summit in 1987, etc. Mr. Pande has participated in numerous conference organized by the ADB and The World Bank. He has also attended various training programs developing a wide range of knowledge base in areas such as “Model Concession Contracts in the Road Sector”, “Management Development Programme”, “Project Implementation and Administration”, etc. He has presented/published more than 10 papers on the transportation infrastructure of Nepal. Mr. Yuba Raj Bhusal was born in Purkot, Banjhakateri VDC-6 Gulmi,on May 27, 1957. He pursued his primary education from his native village and secondary education from Himalaya High School, Dhurkot, Gulmi. He completed his undergraduate (1975-79) studies in Economics and Political Science from Prithvi Narayan Campus, Pokhara, Nepal. He did his M.A. and B.L. from Tribhuvan University, Nepal in 1983 and 1984 respectively. Mr. Bhusal later pursued post-graduate studies in Regional Development Planning and Management from the University of Dortmund, Germany. Finally, he completed his M. Sc. from the Asian Institute of Technology, Bangkok, Thailand in 1996. He was awarded Mahendra Vidyabhushan (Gold Medal) by the then King in 1997 for his outstanding academic performance and had also won topper-student stipend for standing ever first in his College days. Mr. Bhusal had joined Nepalese Civil Service in 1980 as a Section Officer and was promoted to Local Development Officer (LDO) in 1986. During his tenure as LDO (1986-94), he served as an ex-officio Secretary of the District Development Committees (DDC). His illustrious works with the elected political officials of the DDC, under the partyless (Panchayat) and multi-party regimes, was highly commendable. His understanding of cultural sensitivity was revealed when he successfully managed to establish and retain effective working relations in multi-cultural, multi-ethnic and multi-party political milieu. He was promoted to the position of Joint Secretary in 1997. After briefly working at the Ministry of General Administration, he joined the Ministry of Finance (MOF), Nepal in early 1998. At the MOF, he was the Chief of the Budget and Program Division. Under his dynamic leadership, three annual budgets were formulated (1999-2001). He also led the preparation of Nepal's first Budget Manual 2000 to be utilized for budgeting by public sector agencies. He served as a Member of the high-level Pay Commission, 1999 mandated for revising the pay scale of the public sector employees. The then Government respected its recommendations and substantially increased their salary. Mr. Bhusal worked as the Member-Secretary of the Public Expenditure Review Commission (PERC), 2000. The PERC had recommended for essential expenditure reforms, which were later implemented by the government. This report guided the initiatives for the first time in Nepal to prioritize the development programs/projects (P1, P2, P3) under different criteria and the Medium Term Expenditure Framework was also introduced. The Government of Nepal deputed Mr. Bhusal to the position of Nepalese Consul General in Kolkata, India from 2001 to 2004. He took several proactive initiatives to strengthen bilateral relationship between Nepal and India. He also stimulated trade, transit and bi-lateral investments through economic diplomacy. It was Mr. Bhusal who had first flagged off the direct-train bound for Inland Container Depot (ICD) at Birgunj dry-port, Nepal from Kolkata in July 2004 (http://nepalitimes.com/news.php?id=2622). His versatile capacity in the area of program/provincial budgeting system was also recognized by UNDP whilst it selected him, through a competitive examination, as the Int’l Provincial Budgeting Advisor to the Ministry of Finance, Kabul, Islamic Republic of Afghanistan for the period of 2007-08. Mr. Bhusal had worked with the Office of the Prime Minister and Council of Ministers (OPMCM), Nepal for about three years as a Joint Secretary. He had initiated to modernize and establish information technology-friendly infrastructure, grievance handling procedures, coordination, and monitoring and evaluation desk for the Line Ministries. While serving as the OPMCM’s spokesperson, he operationalized a modern documentation system too. Meanwhile, he was assigned the responsibility of Acting Secretary in the Ministry of Land Reforms and Management (2005-06). Among other reform initiatives, Mr. Bhusal’s foremost contribution was the concept of land banking he brought to light. Later, he served as the Member-Secretary of a high-level Administrative Restructuring Commission (2008-09), where he prepared its first Interim Report. When Mr. Bhusal was promoted to the post of (permanent) Secretary in July 2009, his first assignment was at the Ministry of Forests and Soil Conservation. He initiated several efforts to secure convergence between conservation and development. Main programs realized were the forest resource assessment (FRA) project, formulation of ten years multi-stakeholder forestry sector strategy, initiation of Rashtrapati Chure conservation program, maintaining cross border biological corridor program, Mt. Kailash Landscape program, Hariyo Ban program etc. Moreover, under Mr. Bhusal’s proactive leadership Banke National Park was announced and implemented, SAWEN was established, MOU with China was signed to control cross-border trade on wildlife, Madhane, Panchase, Tinjure-Milke etc. were declared protected forests. His study on regional development planning was well utilized when the Government of Nepal assigned him to work as a Member-Secretary of the National Planning Commission (NPC) from May 2011 to April 2014. He coordinated the formulation of the 12th (detailed) and the 13th (Approach Paper) socio-economic development plans along with their annual programs. Mr. Bhusal also led a team in finalizing the United Nations Development Assistance Framework, UNDAF (2013-17) for Nepal. He initiated the Climate Change Budget Code that won GSSD Expo award 2013, established Multi-Sectoral Nutrition Program Secretariat, and signed to establish SMES II, SPMC projects in NPC Secretariat. Mr. Bhusal has been serving as the Finance Secretary for the Ministry of Finance since April 2014. By and large, during his more than three decades of highly progressive accomplishments in the civil service of Nepal, Mr. Bhusal has contributed in various areas of national priorities. His major contributions are in the areas of poverty alleviation in the rural areas through strategic planning, public financial management, resources mobilization and utilization, mainstreaming gender issues in the development process, land use policy and land use management, forest resource management, administrative restructuring, civil service reforms and socio-economic development plans. Mr. Bhusal has visited about three dozens of countries leading various high-level meetings, workshops, seminars, conferences, and training programs in international/regional cooperation agencies like WB group, UNDESA, Rio+20, UNDP, UNICEF, UNFCCC, UNFF, UNEP, UNCBD including its COP 10, World Forestry Congress 2010, World Conservation Forum, UNESCAP, BIMSTEC, SAARC, ICIMOD, Commonwealth and the Colombo Plan. He has been greatly involved in the MDGs, SDGs, SAARC development goals and the IPOA/LDC graduation processes. He has published dozens of research articles and position papers in leading national and international Magazines and Journals. Through his outstanding academic performance both in Nepal and abroad, his experience of working at the local and central government of Nepal in development/governance/economic issues, and his successful completion of assignments in international organizations, he has proved himself as a versatile and successful public sector professional figure. A native speaker of Nepali, Mr. Bhusal is fluent in English and Hindi. He understands Sanskrit, Urdu and Bangla, while moderately communicates in German, Persian/Dari, and Japanese languages too. Interested in swimming, hiking and trekking, Mr. Bhusal loves to travel especially in the countryside. He is happily living with his wife Mrs. Urmila Bhusal, two sons and a daughter. Basanta Shrestha, Director of Strategic Cooperation works at the International Center for Integrated Mountain Development (ICIMOD) with the key portfolio to provide strategic leadership and partnership development to bring about transformative change on ICIMOD’s operations. Mr. Shrestha has a Masters in Engineering in Computer Science from the Asian Institute of Technology, Bangkok, Thailand in 1989 and a Bachelors in Electrical and Electronic Engineering in 1985 from Madras University, India. Mr. Shrestha is well-known for his outstanding strategic leadership quality, an experienced manager and team builder, and proven track-record of excellent networking in the ICIMOD region and around the world. Under his leadership, he has developed highly successful partnerships with the national institutions and strategic cooperation with key international agencies towards sustainable mountain development in the Hindu Kush-Himalayan region. Mr. Shrestha has been instrumental in mobilizing resources and has developed, planned, managed, and implemented highly successful programmes to support mountain development policies and practices. Mr. Shrestha joined ICIMOD in 1990 as a founder member of Mountain Environment and Natural Resources Information System (MENRIS) programme at ICIMOD. Under his leadership, MENRIS is widely known for its pioneering efforts in promoting the use of earth observation and geospatial technologies for sustainable mountain development. He has championed the successful partnerships with NASA and USAID to spearhead SERVIR-Himalaya programme – a flagship initiative to bridge technology and innovation to mountain development challenges. Mr. Shrestha is a key proponent in promoting mountain agenda in the global and regional forums and successfully aligned ICIMOD programmes with global priorities such as GEO, SERVIR, GBIF, FAO, International Space Charter among others. Mr. Shrestha has been granted a Presidential award (2001) and Special Achievement Award (2014) by Environmental System Research Institute, USA, the award was given to his leadership and in recognition of ICIMOD’s contributions towards promotion of GIS technology and applications in the Himalayan region. Mr. Ghimire was appointed as Minister for Home Affairs and Minister for Foreign Affairs of Nepal on March 14, 2013 and he contributed for successful conduct of historic election of the Constituent Assembly (CA). He served in that distinguished position for about a year till the handover to the elected Government in March, 2014. He served as the Chief Secretary of the Government of Nepal, from July 2009 to August 2012, the topmost position of bureaucracy proceeding to his distinguished civil service. 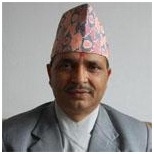 Born on February 07, 1961 in Tansen Municipality-12, Palpa, Nepal, Mr.Ghimire achieved M. Sc. Degree in Rural and Regional Development Planning from Asian Institute of Technology (AIT), Bangkok, Thailand in 1991. He also holds Master’s Degree in Business Administration from Tribhuvan University, Nepal in 1985. In addition to academic degrees, Mr. Ghimire has enriched him with basic and advance skills in several areas through professional trainings, seminars and other rigorous engagements with national, regional and international institutions in and abroad. Professional Experience: Joined civil service in January 1985 as a Planning Officer at the National Planning Commission, Mr. Ghimire progressed the ladder of his career in a very short span of time. He became Under Secretary in 1992, Joint secretary in 1998, Secretary in 2004 and Chief Secretary in 2009. During his 29 year-long civil service career, he enriched and widened his expertise, knowledge and experience. As Under Secretary he was primarily responsible for overall human resource management at the Ministry of Water Resources. 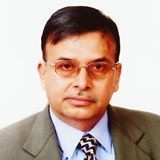 As Joint Secretary, he accomplished several responsibilities like important task of introducing and institutionalizing VAT system in Nepal, a major tax reform initiative of the Government, headed International Economic Cooperation and Coordination Division of the Ministry of Finance from June 1998 to May 2003 and was engaged in landmark reforms in the areas of development cooperation and aid mobilization in Nepal. He contributed to formulation and enforcement of the Foreign Aid Policy 2002, a major instrument to improve aid management and donor harmonization. He worked as a team member of Reform and Development Group within the Government of Nepal in initiating second generation economic and institutional reforms including the preparation of Poverty Reduction Strategy Paper and Medium-term Expenditure Framework. He was the key architect of Nepal Development Forum (NDF) held in 2000 and 2002 in Paris and Kathmandu respectively. In the latter half of 2003, he was appointed as the Consul General of Nepal to Hong Kong and Macau Special Administrative Region of the People's Republic of China. He successfully carried out diplomatic responsibilities. He became Secretary to the Ministry of General Administration in August 2004. He devised several instruments to reorient Nepalese public administration to achieve MDGs. In July 2006, he was transferred to the Ministry of Culture, Tourism and Civil Aviation. As Tourism Secretary, he contributed to the revision and effective implementation of the open sky policies, air safety standards and tourism policy in the country. He also became Secretary to the Ministry of Peace and Reconstruction in January 2008 and was entrusted with the important role of framing appropriate post-conflict policy and planning in Nepal's gradual but throbbing emergence from a state of conflict. Mr. Ghimire successfully completed his tenure of Chief Secretary during the most challenging and turbulent period, when the country had to complete peace process, enhance law and order & good governance and initiate the agenda for socio-economic transformation. He believes that Masters Degree from AIT has become a turning point throughout his career. (1) Director General at Dept. of Water Supply and Sewerage (DWSS). The AIT education has provided me fundamental analytical skills and sound knowledge base that are needed to face the challenges of existing and emerging problems in my professional area in the increasingly globalized world. The interdisciplinary and application oriented approach of higher learning in a truly international environment at AIT has given me the confidence to find solutions to new problems and taught me to remain up to date with the ever expanding knowledge frontier. - B.Eng. (Electrical), M.S. University of Baroda, India, 1973. - Served as a consultant to various international organizations including UNDP, UNEP, FAO, Asian Development Bank (ADB), International Centre for Integrated Mountain Development (ICIMOD). Recipient of The Energy Journal's Best Paper Award from International Association for Energy Economics (IAEE) in 1991. Energy Policies in Asia, McGraw-Hill, Singapore (1987). AIT provided me wider exposure with the academia and international perspectives. The degree earned at AIT gave me confidence in achieving my goals in both professional field and social life. Nepal Academy of Science and Technology (NAST) is an autonomous apex body devoted to promote science and technology in the country. The largest storage hydropower project of national pride and priority. National Planning Commission (NPC) is the advisory body for formulating development plans and policies of the country. NPC is chaired by Honorable Prime Minister of Nepal. NWSC is a sole corporation responsible to supply water for domestic purpose in all major cities of the country. NDRI is a leading and independent research and development institute of Nepal. It aims to address the contemporary policy challenges, such as the gaps between policy and practice, and to influence public policy through rigorous scientific research.